The sample chapter of the book covers IT Systems in Organisations in detail. Download here (PDF, 3.42MB) or view online. Not surprisingly, cartoonists have long made fun of the IT project development process. The classic 'Tree Swing' cartoon (left), in which ten different stakeholders perceive the same project in ten different ways, has more than a grain of truth to it. 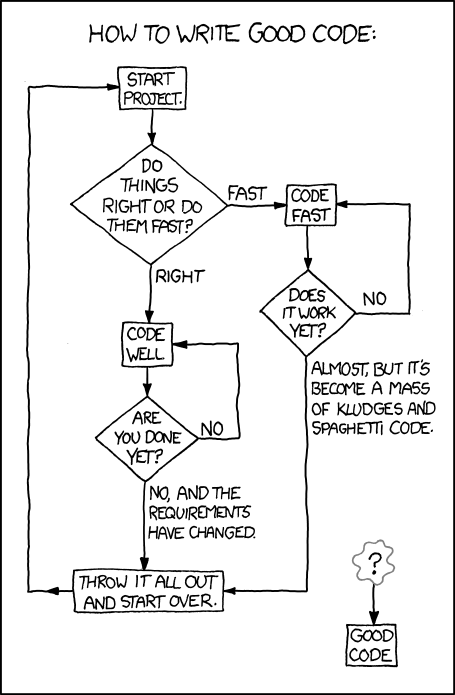 xkcd also has a good attempt with its Good Code cartoon, really summing up the problems of both waterfall and agile methods of software development. How UK banks are flirting with IT disaster (Zdnet) discusses the large amount of legacy hardware and software being used in the UK banking industry. As the BBC reports, banks are likely to suffer more and more software failures as a result of this in the near future. However, Computer Weekly explains that replacing these systems will take years. This Forbes article goes into more detail about the process of upgrading from legacy systems, making it very clear why "Moving a large bank from its existing 20 or 30-year old legacy system to a new core banking platform is often compared to changing engines on an airliner flying at 30,000 feet." Two Ways To Build A Pyramid is an article from Information Week which explains the Agile and Waterfall methods of development in quite a unique way. This is helpful for students who are having problems visualising the PDLC process. Why big IT projects always go wrong is good background reading that explains the difficulty of developing IT projects. GanttProject is an open source tool for creating both Gantt and PERT charts. It is Windows, Mac, and Linux compatible. A classroom activity I like which helps students understand PERT charts is the chicken and pasta task. It asks students to create a PERT chart and the Critical Path for a simple meal (recipe given). User interface prototyping often takes place during the design stage of the System Development Life Cycle (SDLC). Having students develop a sample interface for a system (perhaps the mini case study described above) can be an effective way of teaching the benefits of such tools. FluidUI is a nice online prototyping tool with a free trial. Prototypes can be created for a variety of screen formats, from desktops to mobile phones. There are myriad examples of failed IT projects that can be used to help students studying IT Systems and Organisations understand the importance of the correct development approach. It can be useful to have students research the case studies below and investigate what happened, what went wrong, and what mistakes could be avoided next time. These can be studied as an introduction to the IT Systems in Organisations topic, or towards the end, where students will be able to apply their knowledge to clearly identify the mistakes that were made. The FBI's Upgrade That Wasn't (Washington Post) is a good introduction to the FBI's Virtual Case File (VCF) project. IT Systems in Organisations revision flashcards to test students on the key terms. The 'Learn' and 'Test' modes of Quizlet work best.